Indian Smart Watch Market shipments volume reached 17,465 units in CY Q4 2013; representing an increase of 50% than the previous quarter. SONY emerged as the market leader. Indian Smart Watch Market shipments volume reached 17,465 units in CY Q4 2013; representing an increase of 50% than the previous quarter. SONY emerged as the market leader followed by SAMSUNG. 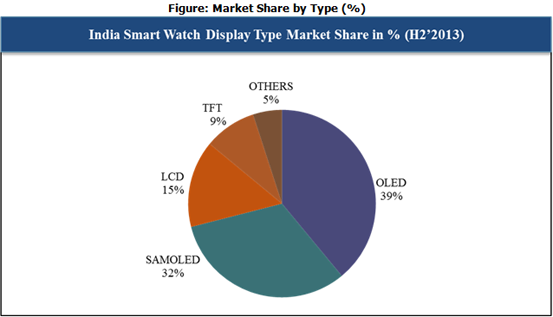 Smart Watch with SAMOLED (Super Active Matrix Organic Light Emitting Diode) display represented 48% of the total market share. 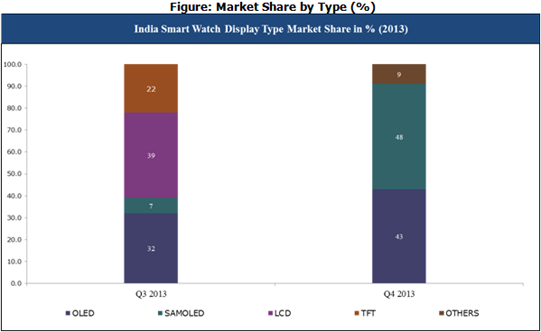 However, Smart Watches with OLED (Organic Light Emitting Diode) display lead the Indian Market in CY H2’2013. In terms of unit shipments, Android system captured lion share of the smart watch market. Whereas, 320x320 resolution segment registered 48% of the market followed by 42% of 128x128 resolution. Others include Transflective LCD, AMOLED and Qualcomm Mirasol. Top two players captured more than 90% of the total market. Around 43% of Smart Watches are lighter than 50g. More than 48% of Smart Watches are equipped with Bluetooth Version 4.0. Smart Watches with Waterproof feature dominates the Indian market with a share of 51%. Further, Camera featured Smart Watch represents 48% of the total Market Share. In display segment, SAMOLED witnessed substantial growth of % market share. The Indian smart watch market is in the emerging stage and consumers are not much aware of this segment. Key players such as Sony and Samsung are adopting aggressive promotional strategies to capture this niche market. Whereas, other major players are yet to enter in this market.